October 25, 1917 marked the beginning of more than seven decades of communist rule in the Soviet Union. On this day, known as the October Revolution, Bolsheviks overthrew the Russian Imperial regime, radically changing the life-course of Russia and its empire. Celebrated on November 7- due to a calendar reform that took place a few months after the revolution -this day was a joyous occasion for generations of Soviet citizens, and a chance to admire ostentatious demonstrations of Soviet power and success. After the collapse of the Soviet Union in 1991, this date lost its national holiday status. However, in a country where the Communist party is still the second largest party in parliament, the nostalgia for former Soviet greatness and its symbols has never quite disappeared. It seems almost inevitable that on the centenary of the Revolution a commemoration of the most important turning point in Russian modern history took place. subsets of Moscow chose to mark the October Revolution. The authorities, eager to avoid stirring up any anti-establishment tendencies, altogether ignored the event, instead co-opting the celebrations by staging a remembrance military march, not of the revolution, but of the 1941 counter-offensive: the push that led the Soviet Union to win the Second World War, or, as it is called in Russia, the Great Patriotic War. A more explicit commemoration of the actual anniversary by some part of the population was unavoidable. Risking a scandal by banning these, the authorities decided to allow limited commemorations take place under close watch. 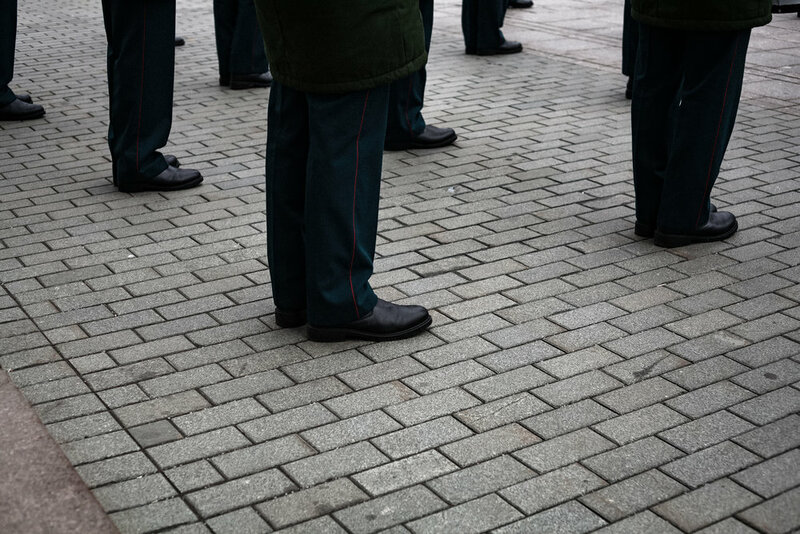 In this tightly-controlled environment, the ‘revolutionaries’ - a bizarre mixture of elderly, nostalgia-driven veterans, young hard-left protesters, and foreign communist romanticists - were confined to the sidewalks. Their slogans, many of which have remained the same in the last 100 years, were drowning in the noise of traffic, and the commemorations were filled with oversized expectations and pathos. The result was the most silent and orderly ‘revolution’ possible. The meticulously staged re-enactment of the 1941 military parade takes place on Red square. Members of today’s working class take a break from work to enjoy the show. A Russian family watches the military parade from the windows of a shopping centre on Red square. Most attendees of the November 7 commemorations seemed to focus their attention on the state-provided entertainment. military tunes in front of Moscow’s Bolshoi theatre. 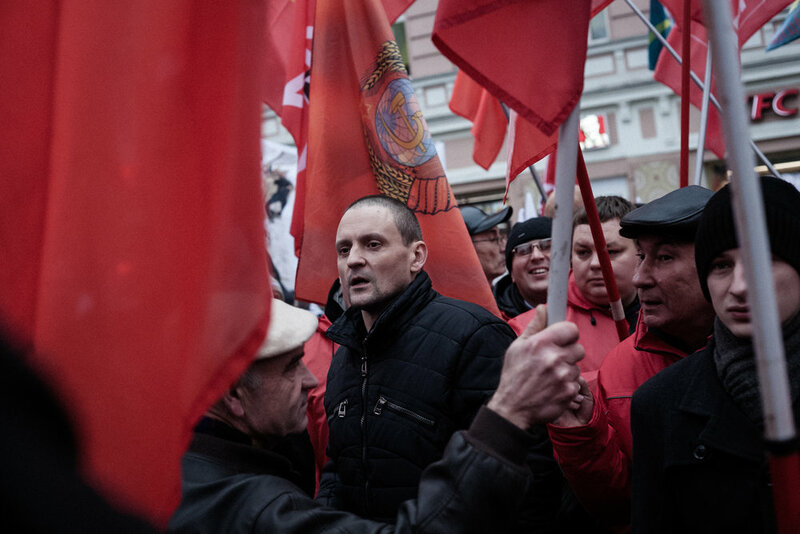 Icons of the past are prepared for a parallel event — a march organized by the Communist Party directly commemorating the October Revolution. 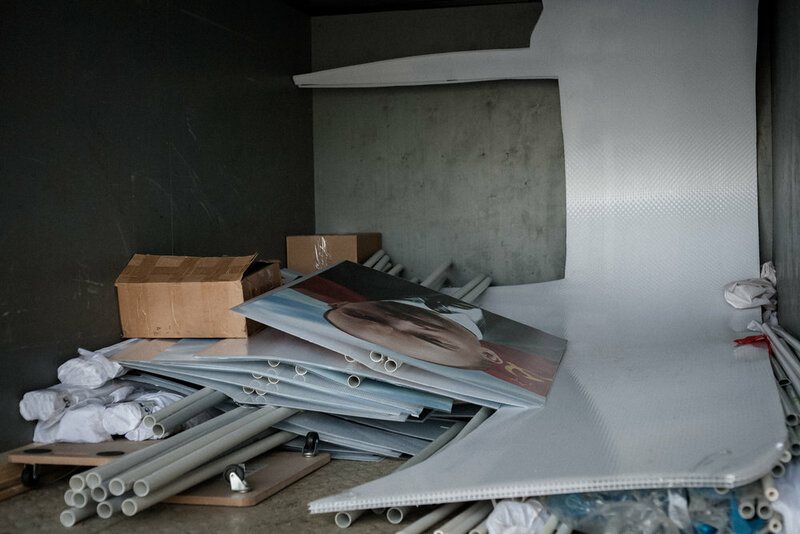 Rather than carrying a message for the future, the Communist Party stuck to tradition and produced retouched portraits of leaders long gone. 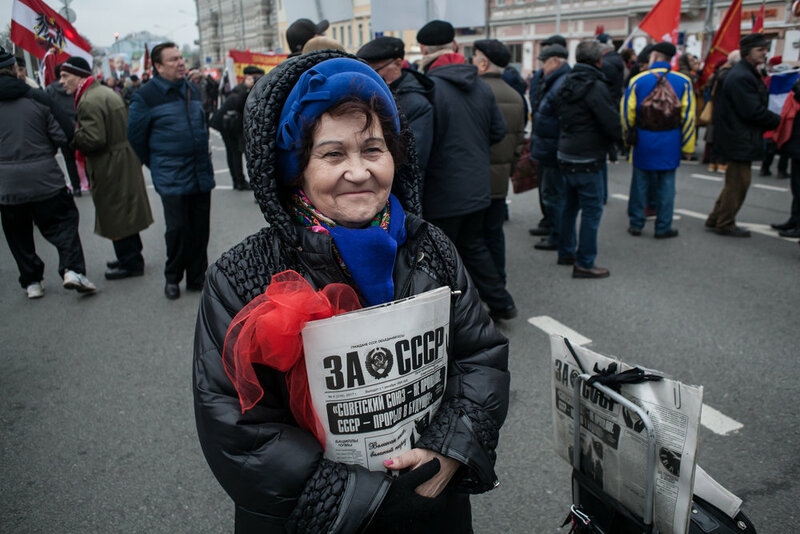 "The Soviet Union isn’t gone, it breaks through into the future," reads a newspaper distributed by an elderly lady at the rally. Sergei Udaltsov makes an expected appearance. This young radical politician has been behind several leftist youth opposition movements. In 2012 he was imprisoned for organizing mass protests against Putin’s inauguration as president, and was released only weeks earlier. Those led by him in the march chant the most radical anti-regime slogans, but they are drowned out in the nostalgic clichés of other attendees. Among the veterans and true communist believers calling for “another revolution”, some exhibits verge on mockery. Two men wearing cheap Red Army costumes push a plastic mock-up of the ship Aurora, the imperial cruiser taken over during the October Revolution whose salvo marked the take-over of St Petersburg Winter Palace. With heavy presence of the anti-riot units, the march is funneled through the sidewalks. As a result, it fails to follow in the classic Moscow tradition of disrupting traffic on the city’s main artery, Tverskaya. After the event, all props are packed up for re-use next year. A revolution did not take place. A cup of coffee for the photographer?